Download "Notes. Score. 1 Basic Services 1.1. 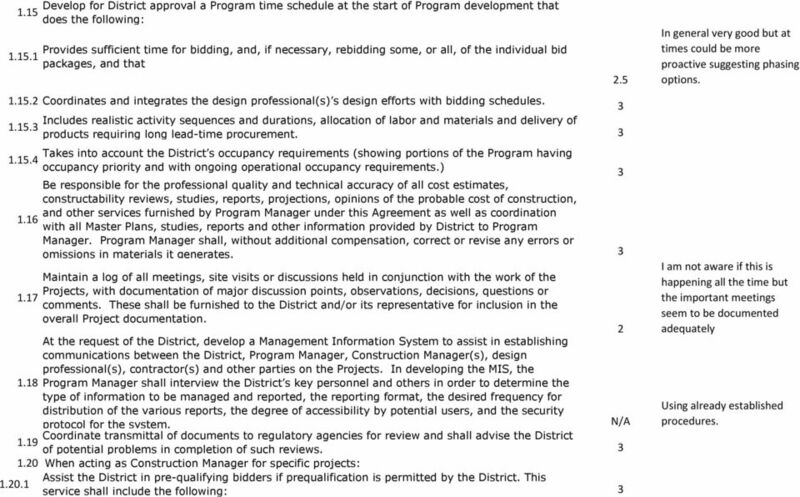 A few instances; could have been more proactive"
3 Develop for District approval a Program time schedule at the start of Program development that 1.15 does the following: Provides sufficient time for bidding, and, if necessary, rebidding some, or all, of the individual bid packages, and that 2.5 In general very good but at times could be more proactive suggesting phasing options Coordinates and integrates the design professional(s) s design efforts with bidding schedules. 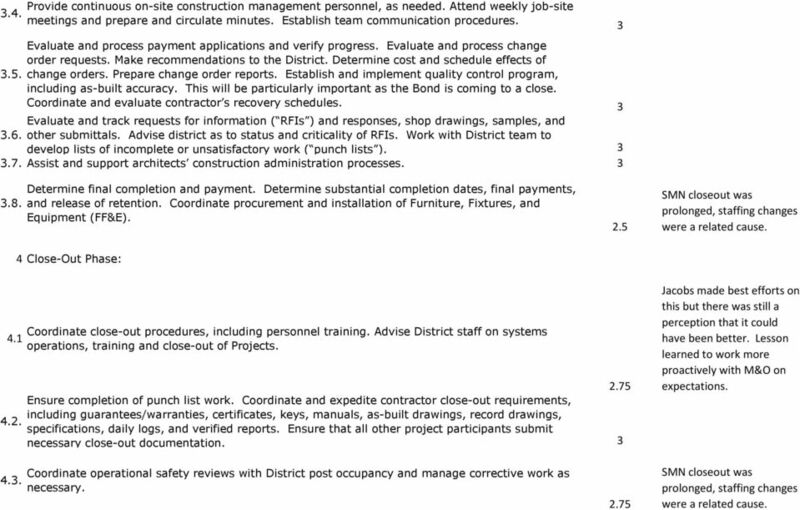 Includes realistic activity sequences and durations, allocation of labor and materials and delivery of products requiring long lead-time procurement Takes into account the District s occupancy requirements (showing portions of the Program having occupancy priority and with ongoing operational occupancy requirements.) Be responsible for the professional quality and technical accuracy of all cost estimates, constructability reviews, studies, reports, projections, opinions of the probable cost of construction, and other services furnished by Program Manager under this Agreement as well as coordination with all Master Plans, studies, reports and other information provided by District to Program Manager. Program Manager shall, without additional compensation, correct or revise any errors or omissions in materials it generates. Maintain a log of all meetings, site visits or discussions held in conjunction with the work of the Projects, with documentation of major discussion points, observations, decisions, questions or comments. 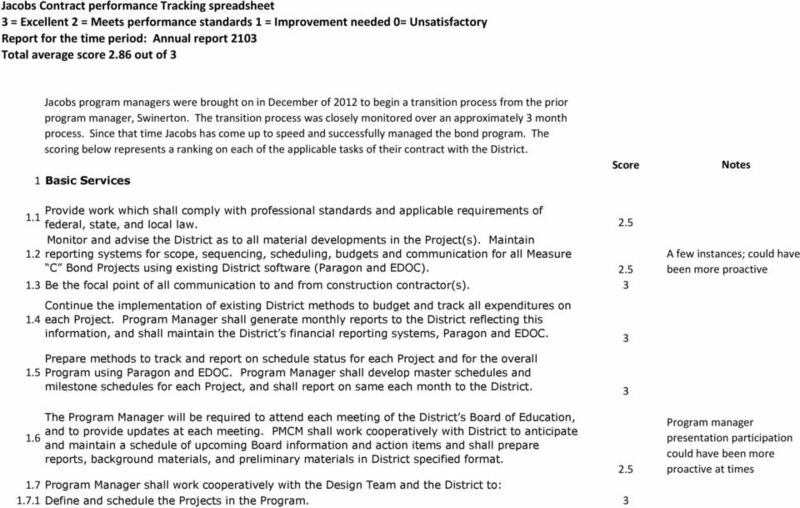 These shall be furnished to the District and/or its representative for inclusion in the overall Project documentation. At the request of the District, develop a Management Information System to assist in establishing communications between the District, Program Manager, Construction Manager(s), design professional(s), contractor(s) and other parties on the Projects. In developing the MIS, the 1.18 Program Manager shall interview the District s key personnel and others in order to determine the type of information to be managed and reported, the reporting format, the desired frequency for distribution of the various reports, the degree of accessibility by potential users, and the security protocol for the system. 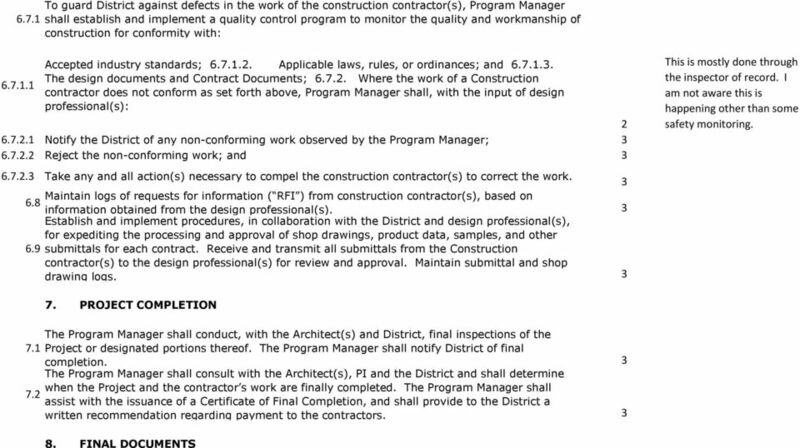 N/A Coordinate transmittal of documents to regulatory agencies for review and shall advise the District 1.19 of potential problems in completion of such reviews When acting as Construction Manager for specific projects: Assist the District in pre-qualifying bidders if prequalification is permitted by the District. This service shall include the following: 2 I am not aware if this is happening all the time but the important meetings seem to be documented adequately Using already established procedures. 4 Preparation and distribution of prequalification questionnaires; 2 Jacobs did not demonstrate expertise in this area and we used Schoening group at additional cost to the District Receiving and analyzing completed questionnaires; Interviewing possible bidders, bonding agents and financial institutions; and Preparing recommendations for the District. 2.5 Conduct a telephonic and correspondence campaign to attempt to increase interest among 1.21 qualified bidders. Assist the District in preparing and placing notices and advertisements to solicit bids for the 1.22 Project. Cooperate and coordinate with the persons responsible for operation of the District s labor 1.24 compliance program, if applicable. Comply with any storm water management program that is approved by the District and applicable 1.25 to the Project, at no additional cost to the District. Ensure that all Project contractor(s), Project sub-contractor(s) and Program Manager s subconsultant(s) comply with any District-approved storm water management program that is 1.26 applicable to the Project, at no additional cost to the District Provide direction and planning to ensure Project adherence to applicable environmental requirements such as those emanating from the Environmental Protection Agency (EPA), Cal/EPA, the California Environmental Quality Act ( CEQA ), Air Quality Management District and State of California and Regional Water Quality Control Board laws, regulations and rules. 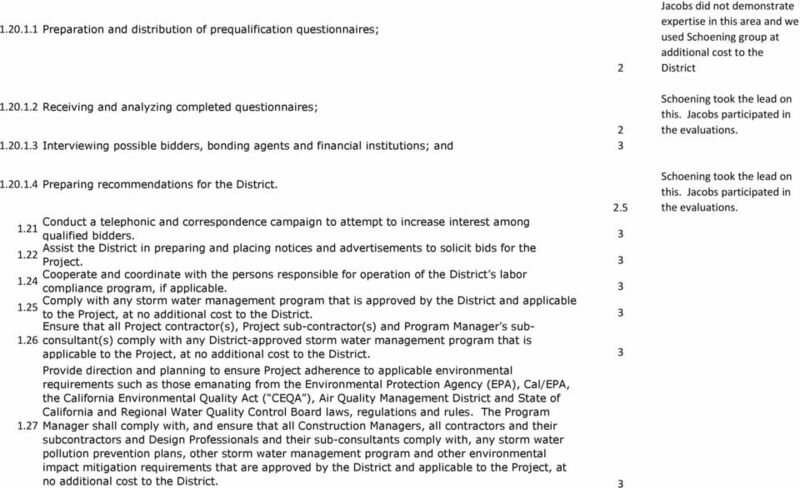 The Program Manager shall comply with, and ensure that all Construction Managers, all contractors and their subcontractors and Design Professionals and their sub-consultants comply with, any storm water pollution prevention plans, other storm water management program and other environmental impact mitigation requirements that are approved by the District and applicable to the Project, at no additional cost to the District. Schoening took the lead on this. Jacobs participated in the evaluations. Schoening took the lead on this. Jacobs participated in the evaluations. 5 1.28 Program Manager shall maintain accurate cost accounting records maintained with generally accepted accounting principles (GAAP) on authorized work performed under unit costs, actual costs for labor and material, or other basis for maintaining required accounting records. Program Manager shall provide accounting records to the District on a monthly basis, or as reasonably requested by District. Program Manager shall afford the District access to these records and preserve these records for a period of three () years after final payment, at no cost to the District. 2. GENERAL PROGRAM SERVICES General: Monitor and advise the District as to all material developments in the Project. Program Manager shall develop and implement with District approval reporting methods for schedules, cost and budget status, and projections for each project in the District s Program Scheduling: Prepare methods to track and report on schedule status for each project and for the overall Program. 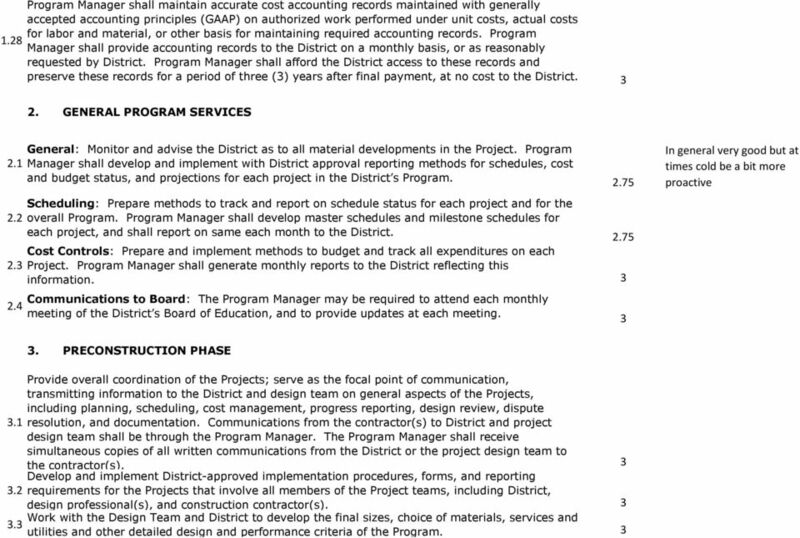 Program Manager shall develop master schedules and milestone schedules for each project, and shall report on same each month to the District Cost Controls: Prepare and implement methods to budget and track all expenditures on each Project. Program Manager shall generate monthly reports to the District reflecting this information. Communications to Board: The Program Manager may be required to attend each monthly meeting of the District s Board of Education, and to provide updates at each meeting. In general very good but at times cold be a bit more proactive. PRECONSTRUCTION PHASE Provide overall coordination of the Projects; serve as the focal point of communication, transmitting information to the District and design team on general aspects of the Projects, including planning, scheduling, cost management, progress reporting, design review, dispute.1 resolution, and documentation. Communications from the contractor(s) to District and project design team shall be through the Program Manager. 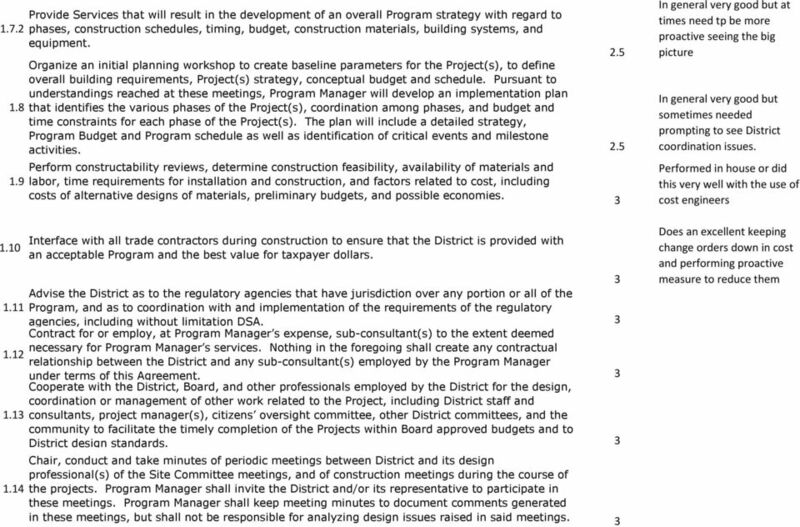 The Program Manager shall receive simultaneous copies of all written communications from the District or the project design team to the contractor(s). Develop and implement District-approved implementation procedures, forms, and reporting.2 requirements for the Projects that involve all members of the Project teams, including District, design professional(s), and construction contractor(s). Work with the Design Team and District to develop the final sizes, choice of materials, services and. utilities and other detailed design and performance criteria of the Program. 10 8.1 The Program Manager shall review and monitor all as built drawings, maintenance and operations manuals, and other closeout documents to be sure all required documents meeting contract requirements are provided, and shall secure and transmit to the District those documents and all required guarantees, keys, manuals, record drawings, and daily logs. The Program Manager shall also forward all documents and plans to the District upon completion of the project and ensure all such plans and documents are well organized for any appropriate audit or review of the project. 2.5 This task is not yet complete for the SMN, PA and CSC projects WARRANTY The Program Manager shall implement a Warranty Inspection and Warranty Work procedure that all contractors are to follow. The procedure shall include a twelve (12) month call back period and a final warranty inspection eleven (11) months after Project completion to inspect the Project and identify any outstanding warranty work. RESPONSIBILITIES AND SERVICES OF CONSTRUCTION MANAGER Construction Manager shall provide professional services necessary for completing the following: 1 Programming and Design Phase: Assist with the detailed definition of project scope, budget, and schedule, as needed. Review and reconcile cost estimates from the assigned architect and coordinate peer review estimates when 1.1 requested by the District. Assist in segregating bid packages for maximum cost effectiveness for the District. Advise the District regarding owner-supplied equipment and other potential costsaving measures. Assist the District in the solicitation and retention of design and engineering consultants, and 1.2 coordinate design consultants activities and delivery schedules, as needed. Provide value engineering and life cycle cost analysis.. Provide design-phase services in conjunction with all architecture firms awarded work by the District. Work with the architects to conform and refine designs to correlate designs to budget and Facilities Master Plan. Review design documents for constructability, scheduling, consistency, and 1. coordination during schematic and design development phases of work. Perform constructability reviews at appropriate stages of design. Assist with verification of site conditions. Expedite design reviews, including modifications. Keep accurate documentation of all discussions with users regarding scope and resolution. 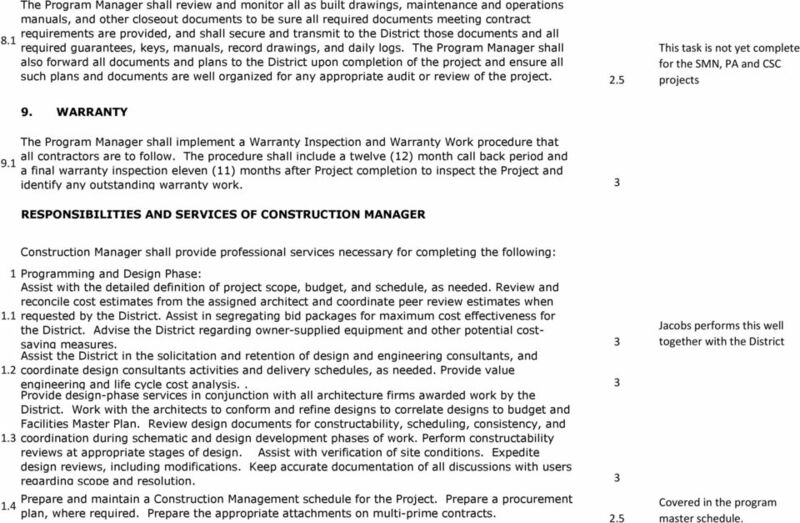 1.4 Prepare and maintain a Construction Management schedule for the Project. Prepare a procurement plan, where required. Prepare the appropriate attachments on multi-prime contracts. 2.5 Jacobs performs this well together with the District Covered in the program master schedule. 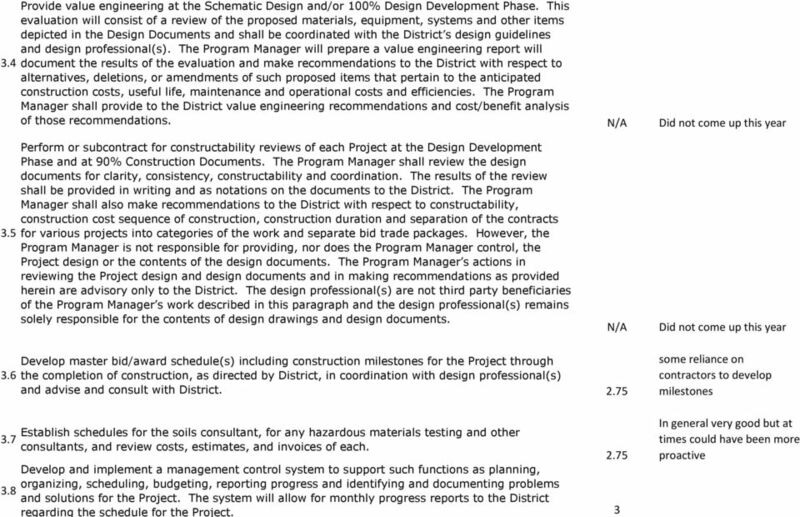 11 Monitor and report to the District on status of design and state approval versus the schedule for 1.5 each project. Attend meetings to coordinate design efforts for the Bond Program. Assist in identifying and obtaining all necessary approvals. 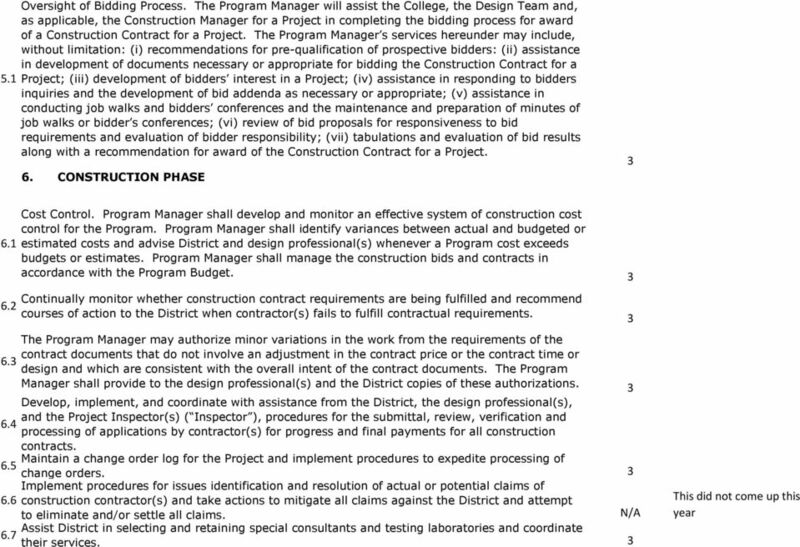 2 Procurement Phase: Develop master schedules and construction schedules for each Project. Develop budgets for each 2.1 project based on construction cost estimates Assist with pre-qualification process for the selection of prime and/or sub-contractors, as the 2.2. detailed definition of Project scope, budget, schedule, and programming support. Develop a shortlist of pre-qualified prime and/or sub-contractors, as required Coordinate all bid phase activities with District departments. Conduct pre-bid conferences and Project site walk examinations with bidders. Prepare public solicitation notices for District approval. Review, coordinate, and estimate cost of bid phase addenda. Assist District with bid evaluations and conduct reference checks. Report to District on results. Conduct post-bid conferences as required. Assist and advise regarding bid protests. Coordinate contracting with low bidders, including evaluating bonds and insurance. Assist with the preparation of agenda items for Board approval. Coordinate submittals required by governing agencies. Covered in the program master schedule. Construction Phase: Develop detailed construction schedules or review contractor s submitted schedules, as needed. Administer and coordinate the work of contractors on a daily basis. Enforce performance, scheduling, and notice requirements. 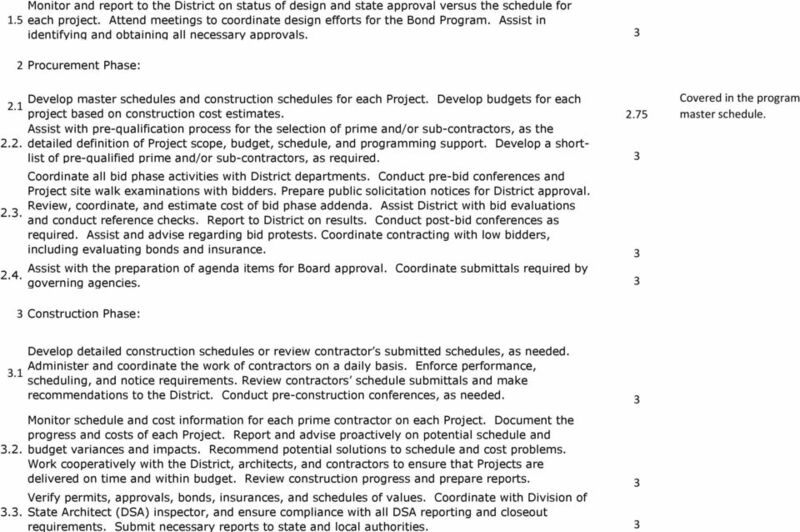 Review contractors schedule submittals and make recommendations to the District. Conduct pre-construction conferences, as needed. Monitor schedule and cost information for each prime contractor on each Project. Document the progress and costs of each Project. Report and advise proactively on potential schedule and budget variances and impacts. Recommend potential solutions to schedule and cost problems. Work cooperatively with the District, architects, and contractors to ensure that Projects are delivered on time and within budget. Review construction progress and prepare reports. Verify permits, approvals, bonds, insurances, and schedules of values. Coordinate with Division of State Architect (DSA) inspector, and ensure compliance with all DSA reporting and closeout requirements. Submit necessary reports to state and local authorities. 12 Provide continuous on-site construction management personnel, as needed. Attend weekly job-site.4. meetings and prepare and circulate minutes. Establish team communication procedures. Evaluate and process payment applications and verify progress. Evaluate and process change order requests. Make recommendations to the District. Determine cost and schedule effects of.5. change orders. Prepare change order reports. Establish and implement quality control program, including as-built accuracy. This will be particularly important as the Bond is coming to a close. Coordinate and evaluate contractor s recovery schedules. Evaluate and track requests for information ( RFIs ) and responses, shop drawings, samples, and.6. other submittals. Advise district as to status and criticality of RFIs. Work with District team to develop lists of incomplete or unsatisfactory work ( punch lists )..7. Assist and support architects construction administration processes..8. Determine final completion and payment. Determine substantial completion dates, final payments, and release of retention. Coordinate procurement and installation of Furniture, Fixtures, and Equipment (FF&E). 2.5 SMN closeout was prolonged, staffing changes were a related cause. 4 Close-Out Phase: 4.1 Coordinate close-out procedures, including personnel training. Advise District staff on systems operations, training and close-out of Projects Ensure completion of punch list work. Coordinate and expedite contractor close-out requirements, including guarantees/warranties, certificates, keys, manuals, as-built drawings, record drawings, 4.2. specifications, daily logs, and verified reports. Ensure that all other project participants submit necessary close-out documentation. Jacobs made best efforts on this but there was still a perception that it could have been better. Lesson learned to work more proactively with M&O on expectations. 4.. Coordinate operational safety reviews with District post occupancy and manage corrective work as necessary SMN closeout was prolonged, staffing changes were a related cause. 13 Ensure that all building commissioning requirements have been fulfilled in a timely manner 4.4. through District commissioning agents SMN closeout was prolonged, staffing changes were a related cause. Obtain occupancy permits (where required), coordinate final testing, documentation, and 4.5. regulatory inspections. Prepare occupancy plan report Prepare final accounting reports. N/A SMN closeout was prolonged, staffing changes were a related cause. Note: All terms which are defined and which are used throughout this document appear in italicized text beginning with a CAPITAL letter.